Thomas was born on Thursday November 5, 1840 at Doylestown near Doylesburg, Franklin County, Pennsylvania. He was the first child to Sylvester and Agnes (Doyle) Doyle. Thomas received his literary education at the St. Francis Brothers College. His taste led him to choose medicine as a profession and then he attended study at the University of the City of New York under the last class taught by the famous Dr. Mott. Thomas graduated in March of 1865. Dr. Doyle had the benefits afforded by practice in the Bellevue Hospital, of New York. In March of 1869, Dr. Thomas Doyle moved and settled in St. Joseph, Missouri and soon took up rank as a skilled and successful practitioner. He was beloved by all, especially by the poor, to whose calls he always cheerfully responded to. Dr. Doyle was a professor of Principles and Practice of Medicine in the St. Joseph Medical College. His name is prominent in the faculties of the St. Joseph Medical College and with the Ensworth College. He was a member of the American Medical Association, and also a member of the Northwest District Medical Association. Thomas was also the Health Officer of St.Joseph in 1877 and 1878. Dr. Thomas was an ardent Democrat and was elected mayor in April of 1886 and served for two years. He also was a member of the United States Board of Pension Examiners and was prominent in the councils of his party. 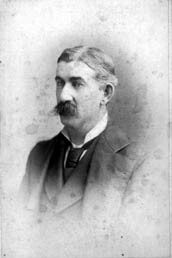 Dr. Thomas Doyle was married on October 12, 1871 in St. Joseph, Missouri, Buchanan County. He married Margaret Genevieve Sheehan, daughter of John Edward and Francis Sheehan of the same area. Dr. Thomas and Margaret had four children, Mary Francis Agnes Doyle born on September 15, 1872 and John Monohan Doyle born January 29, 1874. It was stated in the obituary of Margaret that two of her children died in childhood. They were shown as M.D. Doyle and W.H. Doyle. No other information has been found on these children. Dr. Thomas and Margaret was of the Catholic faith. He was also a leading member of the Cathedral Parish. He believed that the principles of the Bible applied to the hearts of men is the essential doctrine, rather than the sectarian idea, that I am right and you are wrong. As a citizen Dr. Thomas was highly respected; as a practitioner he was very able and skillful; and as a lecturer he was practical and progressive. In the St. Joseph Gazette dated November 23, 1899 it stated that Dr. Thomas H. Doyle had his satchel containing his surgical instruments stolen from his buggy while he was making house calls. The items were with Dr. Doyle for a long time and he regretted losing them. Margaret passed away from complication of disease on Sunday June 16, 1912. Dr. Thomas H. Doyle resided at 301 North Ninth Street in St. Joseph, Missouri until his death on Tuesday February 25, 1913. The day Dr. Thomas H. Doyle passed away, Mayor C. A. Pfeiffer directed that the flag over City Hall be placed at half mast in recognition to the memory of former Mayor Doyle. Dr. Thomas and Margaret Doyle are buried in block 8, lots 131 and 132 in the Mount Olivet Cemetery in St. Joseph, Missouri. On the interior South wall of the St. Joseph Catholic Cathedral in St. Joseph, Missouri, a stained glass window is marked by a brass plate dedicated to the memory of Dr. and Mrs. Thomas H. Doyle.